Made without nitrites or any other nasties. A unique air dried and deliciously smoky recipe. British Pork. 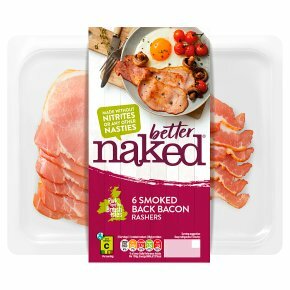 The naked truth We always look at what's wrong with food to figure out how to make it the best it can be, so we've done it again by making your bacon Naturally Tasty! And made without nitrites or any other nasties The holy grail of bacon! The Boring Bit! Always cook Naked Bacon... Never cook Bacon Naked! Med/High Grill 8 minsPreheat your Grill to a Medium to High heat, and while waiting take your Naked Bacon from the fridge, remove from all packaging and rest a while. We love focussing on food and not the washing up so line the grill with foil and arrange the bacon onto the foil ensuring the rashers aren't snuggled too close ¯ grill for 4 minutes each side until nice and crispy, taking time to savour those lovely aromas. Check product is cooked & piping hot throughout. Always wash hands, all surfaces and utensils after handling raw meat. Do not reheat.